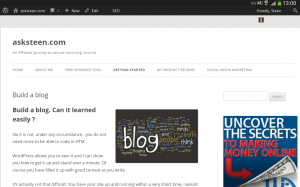 Build a blog. Can it learned easily ? No it is not, under any circumstance , you do not need more to be able to code in HTM. 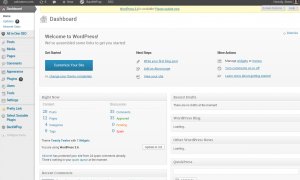 WordPress allows you to own it and I can show you how to get it up and stand over a minute. Of course you have filled it up with good context as you write . It’s actually not that difficult. You have your site up and running within a very short time, I would say about 1 minute. but it takes a long time and cost of energy is to build the great. The technical is really easy. There are 3 things that I want you to think about before you begin. What is your purpose to make a blog. It’s more than shurre no one can not find what I have written. Yes , first off all, it is important that you know something about the subject or would like to learn about it. Of course it is not something that happens from one day to another, you must have some traffic and found your audience. And off course you also have to get ranking so people will visit you pages and post. ut you can learn it. Yes you heard right for free. What you need is the right training , the know so you whatever you want to write about will put it right up. Yes there are many systems that are designed to purchasing. Either made an expensive pacage. Work up costing much more then $ 1,000 and then really not really give you what you need to build a business interest education. Thought the net I certainly would not say that you can build it up in a week , nor a month. But I can guarantee that each Member who follow the instruction and do what it takes. You take the initiative and participates step by step you will in the long term see the results you want. Of course it takes time to build it big, since you have to do all the work . From what I mighty would like to discuss both but certainly also help you get started with you will eventually learn to be able to build a great brand online itself. This requires that you make a decision and begin to learn and use it. I can help teach you here . Hi there, Steen great blog here u have here, your blog has a good feel to it and its design is clean, thanks for sharing this informative post. Hi Steen! It is always good to be in a business you are interested about. 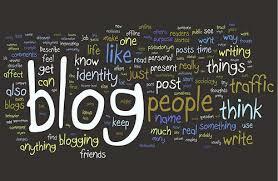 If you are starting a blog or a website, make sure you are really interested in it. Building a blog or a website is a long term business and you do not want to be stuck on something that you have no interest in. Wealthy Affiliate can assist you to find your dream job. Keep up the good work Steen! Thanks Jack You certainly right. It’s certainly not all of us have neither the need nor the desire to build a website. It requires a lot of work just to get a little bit readers. I am also afraid that most stops in the middle of the process and it seemed to me a bit annoying. The good thing is here that you can actually learn how to build the foundation for your website and you can do it for free without getting caught in an additional sales Circus. It seemed to me not you deserve when you just want to build up an online platform. Hi Steen, Building a blog is certainly one of the best and legit ways to build an online business and income through your passion. I have my blog too and all I can say is that it’s really funny to do a work that you love and make money from your blog. But it takes some time before you write original content that can be helpful to people and the best program to get trained in is Wealthy Affiliate. I tried it and I’m impressed. They can teach you all you need to build an authority blog and if you are patient and willing to put in the work, it will pay off. Whether it’s a blog or a static website you build, so I consider it to be very necessary if you want to profile yourself online. Unfortunately there are many who believe that only they have a website they also have a business that they can make money on. But this is unfortunately never quite together. You must learn to write before you get readers, as you also say here. For me it is to have a blog too to have a base line. Is your base big enough and you are skilled enough so you can not fail to make money on it. Very informative site. I was wondering about building up a blog. I love to write but I had to find a niche that I would want to write about month after month. Wealthy Affiliate has helped me understand how to develop my own website. I am glad that you have explained this to other people. Yes WAU is probably one of the best places online to learn how to build a website. I have once been a member there for a few years and still every day learning something new. It is not just to make money online you learn to write about.